Whether you are putting a stalk on that big mule deer buck in the high desert of Southern California, or a trophy whitetail on the frozen tundra of Saskatchewan, the last thing you want is to have your binoculars bouncing around with each step alerting your target. To be honest, that is what happens when you use a provided binocular strap or an ordinary binocular harness. Most provided straps usually dig into your neck and aren't very comfortable. The straps on a harness are elastic and flimsy, yet still very popular due to less expense. Your binoculars need to be secure, unmoving and in a place where you can get to them easily. Utilizing a binocular chest pack, like the S4Gear LockDownX Optics Deployment System, will ensure that the binoculars stay in place and will be easily accessible. I have been testing out the LockDownX for the past two months and I can say they are a definite improvement over basic elastic straps. The people at S4Gear sent me the Realtree APG full camo model. I prefer the camo to all black, but that's a personal preference. This system is very easy to use. You attach your binoculars to the tethered cords on either side of the protective case, fit your bino's in and pull up the bottom flap and secure with the cord. I found that a size 10x42 binocular (the manufacturer was not a factor) fit this system the best. I tried out a relatively small pair, a medium pair and a larger pair. The medium size pair seemed to fit like a glove. The information on the LockDownX says it fits binoculars that range from 5.75” to 7.5” in length. I did not find this to be true. I utilized the KOWA SV 10x50s and they are 7" high. I couldn't get them to fit inside without bending the top metal frame a great deal. Not sure if that was needed, but it seemed like a bit much to get them to fit. 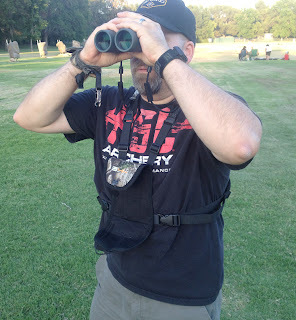 Adjusting the straps/cords was very easy and it was relatively easy to attach the cords to the binoculars. Just be sure you didn't just trim your fingernails. The ringlets are tough and will dig under the nails, or through your skin if you aren't careful. I learned the hard way. Once adjusted to my frame, the chest pack worked well. I did have issues where it rode up a little into my neck, but a slight adjustment to the straps seemed to help that a bit. It still seemed constricting at times, but after wearing it a while and wearing different clothing I was able to reduce that factor. A word of caution regarding the metal hook at the front of the system. If you are loading or unloading gear over the side of a pick-up truck DO NOT wear the chest pack! The metal hook is at the perfect level to scratch up any paint job. I had the LockDownX on and tried to load up my archery targets when the hook came into contact with the quarter panel. Seeing as it was my wife's truck, that has a nice paint job, I backed away immediately and took the chest pack off. The truck was not going to get scratched! With a stiff breeze, dust will kick up from time to time and the case, while it does provide good protection, is not protected on the sides. I did have a few occurrences where dust and debris blew onto the lenses while hiking. Not a major issue, but I wanted to share that in case you hunt a spot that has a lot of dust. All in all, the S4Gear LockDownX Optics Deployment System is a very good alternative to ordinary, rubbery binocular straps. At $54.99 (retail) you get a good product at a decent price. I believe you can find them priced a bit less if you search around. I think the price point should be dropped to $39.99 because of the limited ability to fit larger binoculars. Even still, if you are looking for a good alternative to a bouncy bino harness and want to keep you binoculars protected in a treestand or a stalk, this is a good product for you. I agree with you. The gen 1 was a piece of junk. I went to the Badlands Bino Pack. Love it! I agree with you Eric, the Badlands Bino Case is the way to go. It keeps those expensive optics 100% protected. Every time you clean the lenses on your bino's it is taking life off of them, I hardly ever have to clean my lenses with the Badlands pack. I wouldn't go without it now! I agree as well on the badlands bino case. I have two and rarely have to clean my binos. When busting brush or in the rain you can't beat it.